John Starling and Carolina Star Day proklamert i dag, i Washington D.C.
John Starling tilhører kultfigurene i americana-musikken. Hans soloplater fra 70-tallet er samlerobjekter. Nå slipper Starling og bandet hans nytt album, »Slidin´Home« (Rebel records) og blir samtidig tilegnet en egen dag i Washington D.C.
NOW, THEREFORE, I, THE MAYOR OF THE DISTRICT OF COLUMBIA, do hereby proclaim February 23, 2007, as »JOHN STARLING AND CAROLINA STAR DAY« in Washington, DC, and call upon all the residents of this great city to join me in observing this day as we demonstrate our appreciation of these artists' contribution to a unique American Art Form, and the Art and Culture of the Washington, DC area. Nashville, Tenn.—Soulful acoustic music singer John Starling reunited with two of his Seldom Scene cohorts, Mike Auldridge and Tom Gray, to form Carolina Star. The new band was built for live performances, not only on stage, but also in the studio. In fact, new album Slidin’ Home, due out Feb. 20, was grounded in the philosophy of tracking live in the studio with a minimum of overdubs. That philosophy and the new album were created in collaboration with world-renowned producer and engineer George Massenburg (Frank Sinatra, Linda Ronstadt, Lyle Lovett, James Taylor, Ricky Skaggs). 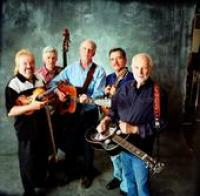 Slidin’ Home will be released on Rebel Records, home of the Seldom Scene’s first recordings. Their approach on the new project centered on a »live/head-on« studio recording option, limiting overdubs to a minimum. Something that will definitely be fun for acoustic music aficionados is the appearance of Emmylou Harris singing alongside Starling on “In My Hour of Darkness.” The song, which Harris co-wrote with Gram Parsons, harkens back to an earlier era when Starling and the Seldom Scene helped indoctrinate Harris into the finer points of bluegrass, its history and traditions. Through the years, it’s been a mutually beneficial musical friendship with Starling and Auldridge joining forces with Harris on “Satan’s Jewel Crown” on her 1975 classic Elite Hotel. She returned the favor, appearing extensively on Starling’s 1977 solo album, Long Time Gone. She also met a young Ricky Skaggs in Starling’s living room. Skaggs later joined her Hot Band. It was also Starling who encouraged her to put together her all-acoustic Nash Ramblers. In many ways, the careers of Starling and Harris are inexorably intertwined—much to the delight of fans. The new record was recorded in Franklin, Tenn., where Starling, Auldridge and Tom Gray were joined by some of the top studio musicians from Nashville and Washington, D.C. DigiDesign's Pro Tools HD was used as the primary recording tool. One of the advantages of modern digital recording was the ability for audio »surgery« to be carried out on live, good feeling tracks. That gave the band the freedom to record in a “sittin' around and pickin', no headphones allowed" mode. The results were an unmitigated success. Slidin’ Home has an intimate, organic sound that captures the magic that happens when great players come together to create music for the sheer love of the craft. One of the highlights of the album is a cover of the Little Feat classic “Willin’.” The band’s subtle, acoustic approach and Starling’s restrained, but passionate singing put a new plaintive spin on this classic open-road anthem.